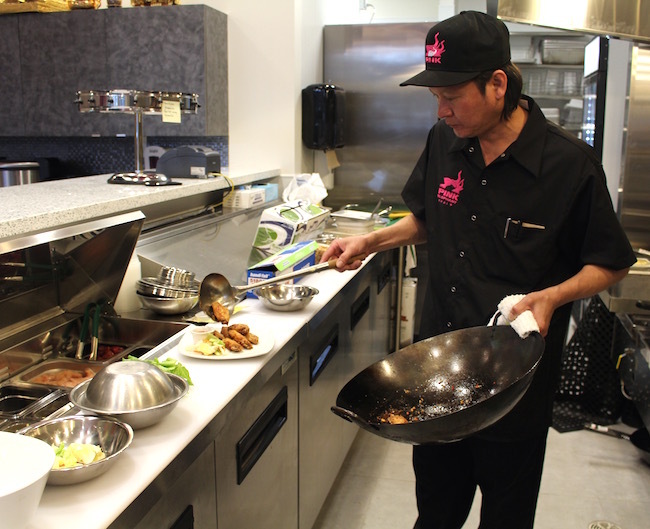 The Marine Gateway transit and retail hub has one more tenant open: Hungry shoppers and movie-goers can enjoy a Thai feast at the newest location of Pink Elephant Thai. 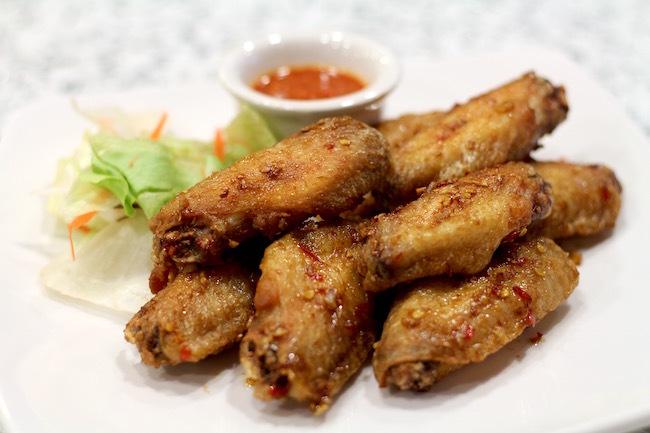 Part of the Thai House group of popular restaurants, this sixth, and latest, eatery reflects the expansion of their Pink Elephant brand of modern, fun, boundary-pushing authentic fare in a bright and lively atmosphere. Inside the 40-seat restaurant, a custom mural takes a street-art meets Thai culture approach to the notion of pink elephants, pairing up a trio of the beautiful animal with Thai writing–specifically a series of numerals with special significance to Thai House’s Desmond Chen. 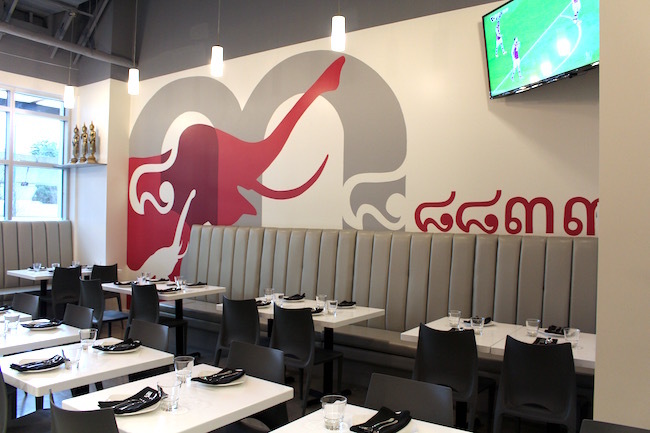 “To somebody [the mural] looks simple, but a lot went into creating it,” attests Chen, articulating a perspective that may well be applied to Pink Elephant Thai as a whole. In the open kitchen is an all-Thai brigade, and each member (in their street-chic black snap-back hats) brings their expertise to the recipes, which reflect a meld of northern and southern Thai dishes, many with a contemporary and cross-cultural twist. “It’s about the creativity,” adds Chen, who also wants to create a casual vibe for customers. The menu is split between Happy Hour options, lunch, and dinner. Daytime customers will be delighted with the emphasis on value, from several appy choices in the $5 to $10 range from 3 to 6 p.m. daily, while lunch customers will find lunch combos showcasing flavourful mains for just $10 each. At dinner time, sharing is encouraged with their appetizers and mains. 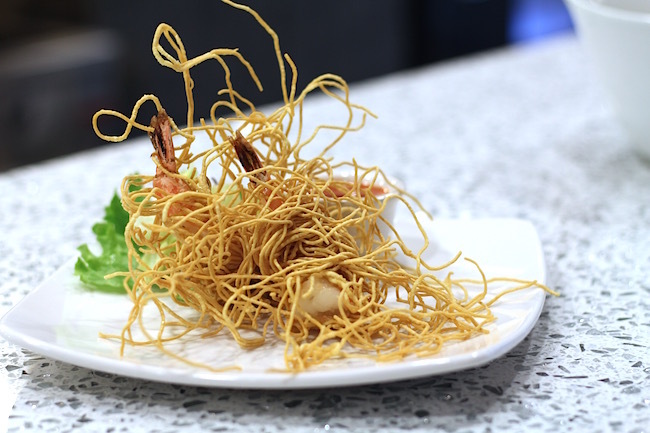 Kick things off with one of their signature dishes that exemplifies their modern presentation of traditional food, like Goong Noon Hea (Deep-fried tiger prawns wrapped with crunchy noodles). 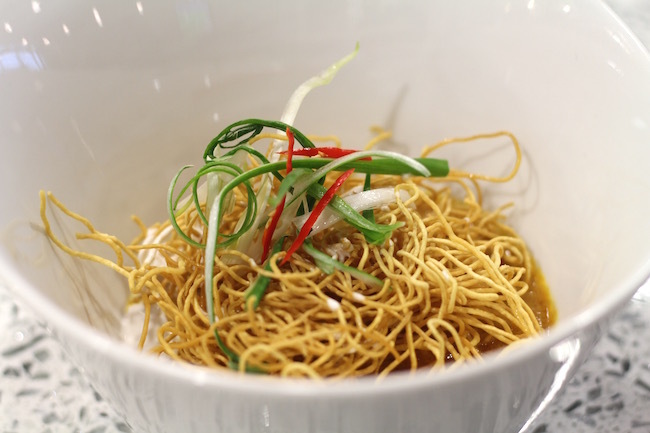 Or try a dish seen less often on local menus, like their Khao Soi (Northern Thai curry soup noodles with chicken or beef). Pink Elephant also features beloved and familiar Thai eats, like Pad Thai, fried rice, curries, soups, and salad, featuring the bold spices and bright flavours that are the calling card of Thai cuisine. Pink Elephant Thai at Marine Gateway enjoyed a “soft open” phase last week aimed at welcoming friends and family, and is officially open Monday, March 7. Chen is really excited to have Pink Elephant Thai in the emerging hub of the Marine Gateway area, particularly as so many condos are going up in the vicinity. Ideal for all those nearby high-rise dwellers will be Pink Elephant’s take-out option, though Chen says they are looking into how they could facilitate delivery given the limited parking options their courier or driver would have at the restaurant. With the opening of the new Cineplex cinema last week, people catching a show can also opt to hit up Pink Elephant before or after their movie; the restaurant is open to 10:30 p.m. nightly, though if the demand is there, they could potentially extend their hours for the later crowd in time. Hours: Daily 11 a.m. to 10:30 p.m.